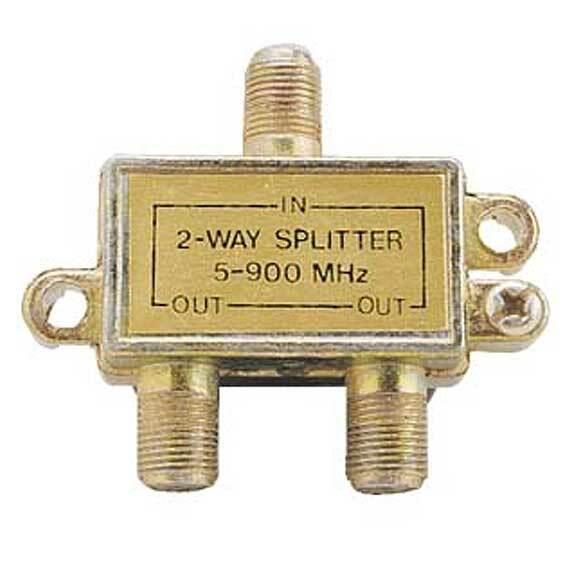 Our 2-way Signal Splitter splits a coaxial video signal from cable TV; antenna or a VCR for connection to 2 TVs/VCRs. Our 3-way Signal Splitter splits a coaxial video signal from cable TV; antenna or a VCR. Our 4-way Signal Splitter splits a coaxial video signal from cable TV; antenna or a VCR. Our 6-way Signal Splitter splits a coaxial video signal from cable TV; antenna or a VCR. Our 8-way Signal Splitter splits a coaxial video signal from cable TV; antenna or a VCR. TV signal splitters help split a signal coming from a single cable so that multiple TVs can receive it. A signal splitter helps save money by avoiding the need for a completely new cabling system for the additional TV set. We at SF Cable offer an assortment of TV Signal Splitters. Our quality TV Signal Splitters include 2 way 5-900MHz Signal Splitters, 3 way 5-900MHz Signal Splitters, 6 way 5-900MHz Signal Splitters, 8 way 5-900MHz Signal Splitters and Ground Block. Explore different types of TV Signal Splitters at SF Cable, one of the leading online stores for cables and related electronic accessories . We are committed to offer quality products at the best prices possible on the internet. With SF Cable, you can also have lifetime technical support on our TV signal splitters.